What’s New? highlights a new website design featured in our gallery. 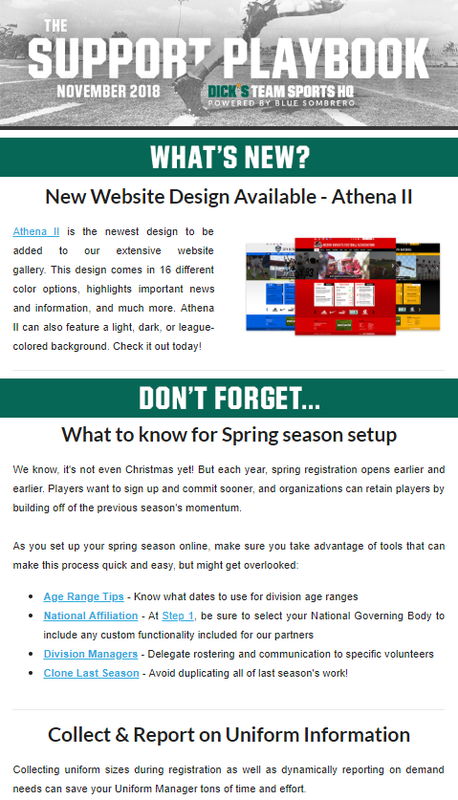 Athena II tops off a busy year as we have added updated designs almost every month! Don’t Forget…Spring season preparation can never happen too soon, so be sure to stay on top of some often missed tools that will help get you ahead of the game. If you collect and manage uniform orders during registration, we have some predefined questions and reports that are built to make this quick and easy! Did You Know? Website analytics are surprisingly easy to track using either Google Analytics or Facebook Pixel, or both! They are free to set up, simple to enable, and can give you a ton of useful insight into your website traffic. Holidays are busy, and we want to make sure you do not miss out on getting the help you need during one of the busiest times for our Support Team. Let’s Hear From You during the holiday season, as there are many ways you can keep in touch with us and get the help you need. Market Your League through an updated, modern looking website. It is the face of your organization, so be sure to keep content updated and utilize every aspect of the design you choose. We review a partner’s website to highlight how to get the most value out of our website.